What Day Of The Week Was September 11, 1961? 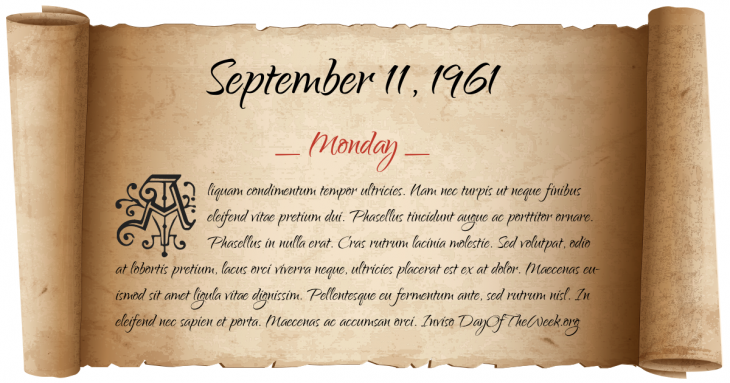 September 11, 1961 was the 254th day of the year 1961 in the Gregorian calendar. There were 111 days remaining until the end of the year. The day of the week was Monday. A person born on this day will be 57 years old today. If that same person saved a Penny every day starting at age 7, then by now that person has accumulated $184.84 today. Foundation of the World Wildlife Fund. Hurricane Carla strikes the Texas coast as a Category 4 hurricane, the second strongest storm ever to hit the state. Who were born on September 11, 1961?